Dr. Janine Sherrier is a Professor, Plant & Soil Science and Biological Sciences in the department of Plant and Soil Sciences, Delaware Biotechnology Institute, University of Delaware, USA. Prof. Janine Sherrier holds masters degree from Baylor University in 1988 and doctoral degree from Texas A&M University in 1994. Prior to her arrival at the University of Delaware, Sherrier has research experience at Department of Plant Biology, University of Vermont, Burlington, USA and Complex Carbohydrate Research Center, University of Georgia, Athens, USA. Sherrier Laboratory studies beneficial plant-microbe interactions, with a particular emphasis on mutually beneficial symbioses between rhizobia soil microbes and legume plants. During the establishment of these symbiotic relationships, new plant organs termed “root nodules” form on the host plant root where the bacteria convert atmospheric nitrogen into a biologically available form of nitrogen. Sherrier’s team is elucidating the role of plant membrane proteins in the formation of functional beneficial root nodules. Sherrier’s team also partners with UD’s Cooperative Extension to develop new rhizobial inoculants for commercial crop production. 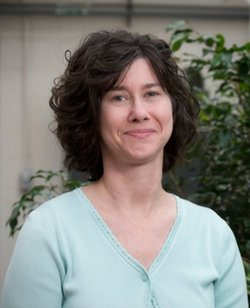 Plant Developmental Biology, Plant Biotechnology and Current Topics of Plant Biology are among her teaching interests. She has been professionally associated with several research societies namely: American Society of Plant Biology, American Association for the Advancement of Science, International Society for Molecular Plant-Microbe Interactions.